There is a good book lurking within this well-meaning jumble of anecdotes and once-boldface names. It covers much of the 1970s, the period of popular music that saw the rise of album rock and the flowering of Fleetwood Mac, Chicago, the Eagles, Linda Ronstadt, Carole King, Rod Stewart, and others. 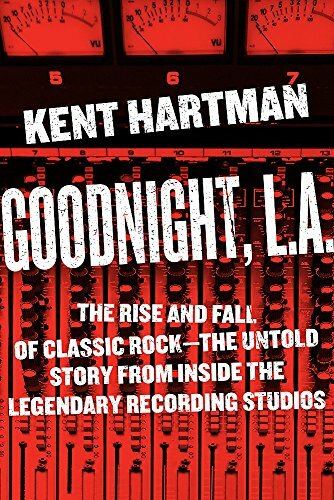 Author Kent Hartman wrote an excellent behind-the-scenes look at the Wrecking Crew, the group of sidemen who generated great 1960s sounds for the likes of the Beach Boys. This title focuses on producer Keith Olsen and dexterous guitarist Waddy Wachtel. They were instrumental (pun intended), according to Hartman, in bringing about “a previous unheard level of human emotion, storytelling, and expansive musicality” in classic rock. The superiority of ’70s rock is itself debatable. Hartman’s technique, moreover, is to cut up stories as if they were strips of recording tape, mix them up, and splice them together. What results are tales from Los Angeles recording studios that are hard to follow, sometimes incoherent. The system defeats its purpose. Just when a reader gets interested in, say, how Fleetwood Mac upped the ante when it created its finest album Rumors, Hartman breaks off his tale: “[T]he lure of going forward with a new producer . . . proved to be an irresistible, if dangerous, draw.” Pages go by with snippets about other albums before Hartman returns to Rumors. Olsen and other first-call producers did take advantage of better sonic systems, mic placements, soundboards, and the long-play element of albums themselves to bring about a crucial change in rock. They recorded individual instruments and voices separately, then layered them into tracks more complex than could be heard in a live performance. The change had begun years earlier with the Beach Boys’ Pet Sounds (released May 1966) and especially the Beatles Sgt. Pepper (June 1967). It’s a shame Hartman does not give credit to the most innovative producer who helped propel the trend, the Beatles’ George Martin. By 1970 everyone wanted to achieve that next step. Olsen had a leg up because he was part owner of a studio called Sound City. Wachtel had the skill and stamina needed for long sessions, so he was hired by one major producer or band after the other. Yet key moments from the era can’t be found in this book. For example, the legendary A&M Studios was the place where in 1971 two of the greatest albums of all time were being made at the same time: Carole King’s Tapestry and Joni Mitchell’s Blue. Los Angeles had supplanted New York and London as rock’s recording mecca thanks to players who loved the weather, the women, the tech-savants, the profusion of fellow musicians . . . and the drugs. Hartman suggests that triumphant groups like Fleetwood Mac and the Eagles delivered Rumors and Hotel California because of—or maybe in spite of—buckets of the white powder. This is hardly a news flash; dozens of books about these two bands alone have divulged their wretched excesses. Eventually rockers made so much money they could afford to build home studios. Cheaper recording gear and digital equipment lessened the need for outside studios. Disco took over the airwaves and clubs nationwide. The album rock era receded as the Reagan ’80s hove into view. Too many peripheral figures—the Cowsills, really?—and deadening details about the parents and childhoods of musicians mar the flow of Goodnight L.A. Happily, the music remains, recycled in box sets and on tours by graying originators, still pocketing big paychecks despite fatigued fingers and frayed vocal cords. A newer technology has extended their careers as it corrects their tired licks: it’s called Auto-Tune. A terrific book about that awaits an author.